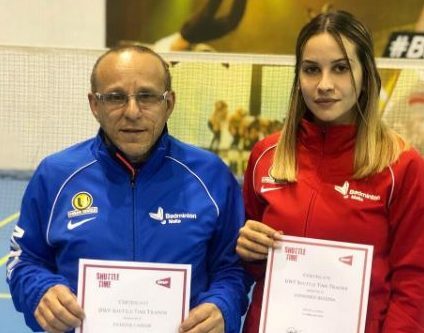 The past season for Badminton Malta was a very busy one on all fronts – local competition, overseas competition and preparation of players for the upcoming events in the near future. The most prominent competition is always the National Championships, which are regularly held during the month of April, and finals played on the 1st May. This year saw many new and young faces in the final stages of these National Championships, which indicates the younger generation is closing the present gap with regards to senior players. In the men’s singles category Stefan Salomone was challenged in the final by 19-year old Owen Grech, who had beaten veteran Kenneth Vella in a thrilling 3 game semi-final. In the other semi-final, another young promising talent, Matthew Abela had to face Stefan who managed to win this encounter in a well battled 2 set matter. In the mens’ doubles Stefan Salomone teamed up with Samuel Cali and had the better of Kenneth Vella and Edmond Abela. The women’s singles event was an all B’Kara BC affair; Fiorella M Sadowski confirmed another National title by beating youngster Yanika Polidano, who played her first National Championships final at the tender age of 15. Fiorella team up with Yanika in the women’s doubles event and eventually put their hands on the title by beating Jo’Anne Cassar and Michaela Ellul. The Mixed Doubles event was an intriguing one this year, as there was good mixture of young talent and experience in the participating pairs. In the final, holders Stephen Ferrante and Fiorella M Sadowski faced a tough challenge against the experienced Kenneth Vella and new blood Sarah Fava. After a 50min 3 set match, Stephen Ferrante and Fiorella M Sadowski took the title home. This meant Fiorella made it her second consecutive triple crown, meaning the winning of the three main events in the National Championship. This season Badminton Malta has also organised the Da Vinci Individual League in 3 categories, Singles, Doubles and Mixed Doubles. A record number of participants took part in these competitions, showing the fast increase of Badminton locally. Badminton Malta organizzat wkoll id-Da Vinci Individual League fi tlett kategoriji li huma is-Singles, Doubles u il-Mixed Doubles. Numru rekord ta’ parteċipanti ħadu sehem f’din il-kompetizzjoni, turija ċara ta’ sport li dejjem qed ikompli jikber. The Singles competition had 49 entries which were divided in 6 divisions. The first division was won by Rostislav Peninska (Birkirkara BC) followed very closely with 2-points short Stefan Salomone (Luxol BC) and Matthew Abela (Paola BC) ended third. The direct encounter between Rostislav and Stefan was decisive, with Peninska having the upper hand. In the second division we saw a very balanced competition with Robert Salomone (Luxol BC) winning the division with 13 points, followed by Kyle Sciberras (Luxol BC) with 11 points and Edmond Abela (Paola BC) with 10 points. The other divisions (3rd, 4th, 5th and 6th) were won by Matthew Galea (Birkirkara BC), Sarah Fava (Paola BC), Wayne Haber (Msida BC) and Brian Gilford (Paola BC) respectively. 54 players participated in the Doubles League with Samuel Calì and Stefan Salomone (Luxol BC) grabbing the title followed by Stephen Ferrante and Aldo Polidano (B’Kara BC). Matthew Abela and Owen Grech finished third. Rodney Abela and Patrick Cassar (Paola BC) won the second division while Edward Haber and Jose Yago Mallari (Msida BC) placed first in the third division. 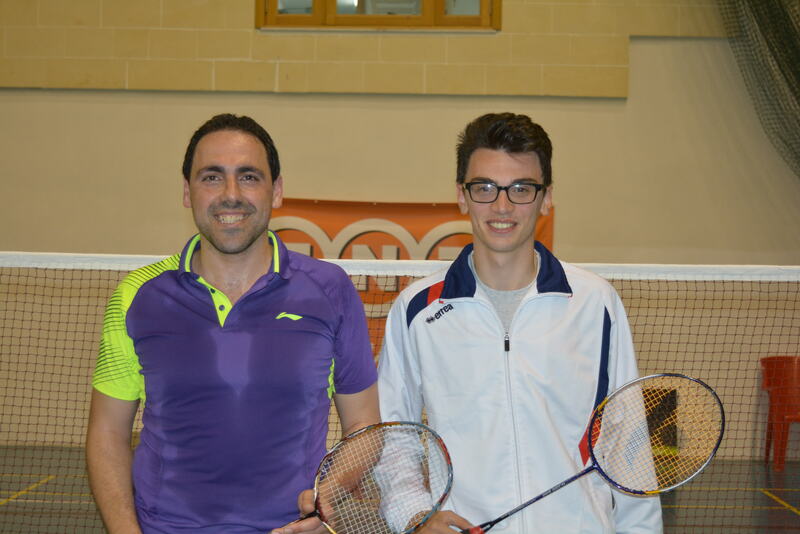 David Attard and Godwin Ellul (Shuttles BC) won the fourth Division. The Mixed Doubles also saw a good number of participants with Stephen Ferrante and Fiorella-Marie Sadowski achieved the top place followed by Matthew Abela and Jo’Anne Cassar (Paola BC) and Kenneth Vella and Sarah Fava (Paola BC). The second division was won by Kyle Sciberras and Tiziana Mifsud (Luxol BC) followed by Nigel Degaetano and Yanika Polidano (Birkirkara BC). Edmond Abela and Martina Vella (Paola BC) placed third. The title of this year’s mixed teams league was won again by B’Kara Smart Office Supplies. Paola 1 BC placed second following a decider played against Luxol Top Choice, after both teams ended up with the same points on the final table. Paola Junior (1) BC won the second title in the junior mixed teams league which was organised for the second consecutive season. This competition gives the opportunity to the younger players to play more games throughout the season. 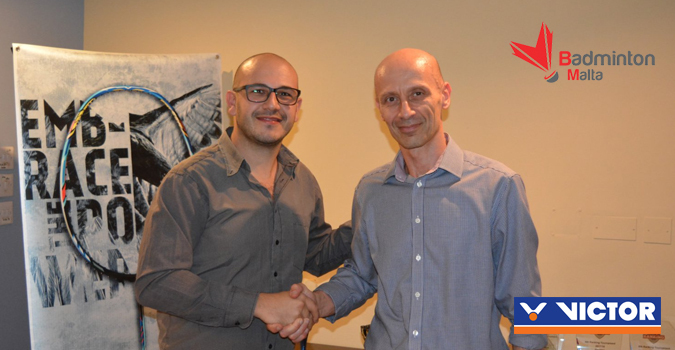 Following the end of the competitive season, Badminton Malta held its AGM at the end of July, where all Executive Council Members were confirmed for the coming 2 seasons. Badminton Malta led by President, Chris Spiteri, together with the local School Sport Federation, will be hosting the ISF(International School Sport Federation) World Badminton Championships in Malta between the 28th March 2016 and the 3rd April 2016. The start of the new season in September will bring along some changes to the local competition, in view of the fact that a new ranking system is being introduced. It is Badminton Malta’s intention to organise new ranking tournaments and make some changes to the current competitions. Spokesperson for Badminton Malta commented on the need to portray Badminton more as an individual sport, the reason why so many changes are being made. 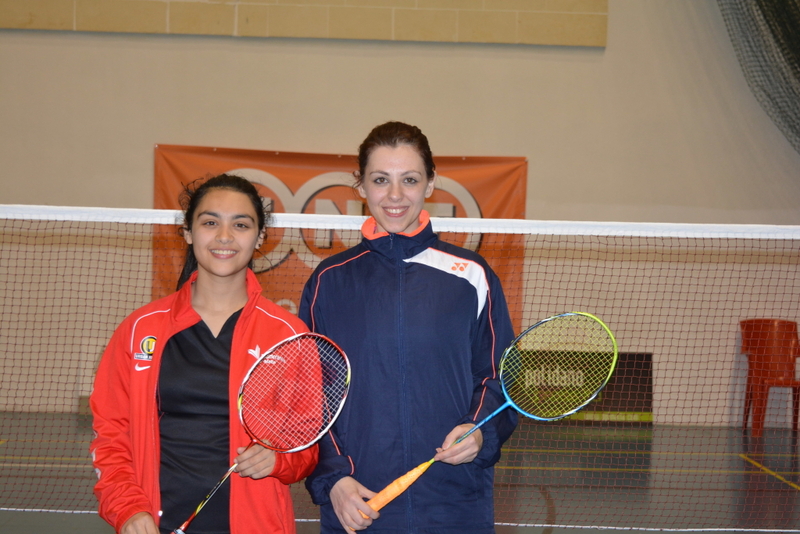 L-aħħar staġun kien ta’ impenn sħiħ għall-Badminton Malta. 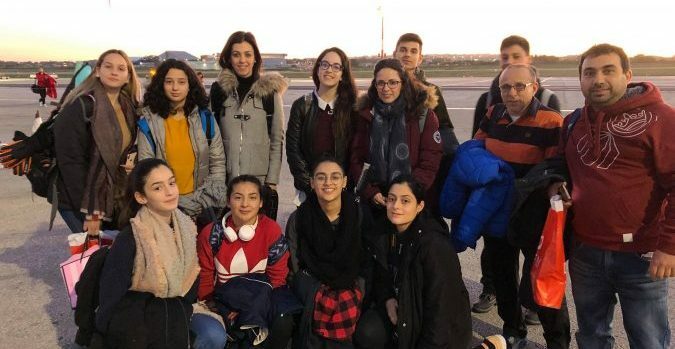 Kompetizzjonijiet lokali, internazzjonali kif ukoll preparamenti ma jieqfux għall-plejers għal kompetizzjonijiet futuri. L-iktar kompetizzjoni importanti, bħall kull sena, kienet il-Kampjonat Nazzjonali, li bħas-soltu kien organizzat f’April bil-finali jintlagħbu fil-bidu ta’ Mejju. Fil-kategorija tas-Singles, Stefan Salomone ħareġ rebbieħ fil-finali meta ġie affaċċjat minn Owen Grech, li għandu 19-il sena. Grech għeleb lill-veteran Kenneth Vella fis-semi finali f’logħba eċċitanti li ġiet deċiża biss bit-tielet game. Fis-semi finali l-oħra Salomone għeleb liż-żgħazugħ Matthew Abela fuq żewġ games. Fil-Mens’ Doubles Stefan Salomone u Samuel Cali għelbu lil Kenneth Vella u Edmond Abela fil-finali. Fil-finali tan-nisa rajna lil Fiorella M Sadowski u Yanika Polidano, it-tnejn plejers ta’ B’Kara BC, jilgħabu fil-finali, b’Sadowski tirbaħ it-titlu b’logħba fuq żewġ games. Għall-Polidano, li għad għanda biss 15-il sena, din kienet l-ewwel finali. 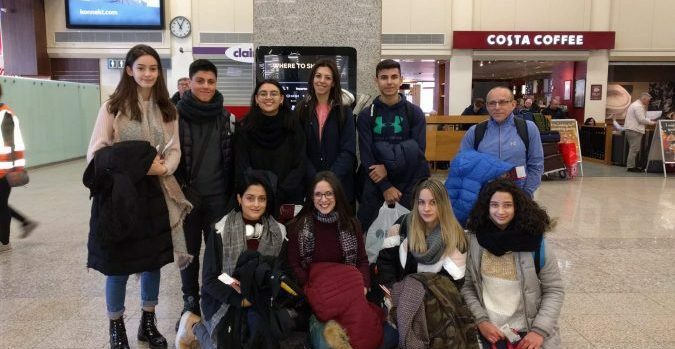 L-istess Sadowski u Polidano għelbu lil Jo’Anne Cassar u Michaela Ellul fil-finali tad-doubles tan-nisa. Fil-Mixed Doubles kellna finali mill-iktar interessanti, b’taħlita ta’ plejers zgħar u oħrajn veterani f’ logħba li damet mux inqas minn 50 minuta u 3 games! 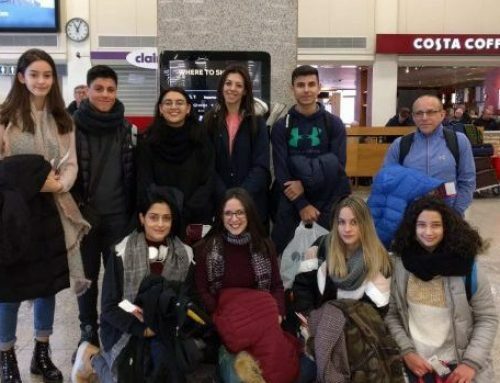 F’din il-logħba, Stephen Ferrante u Fiorella M Sadowski ġew affaċċjati minn Kenneth Vella u Sarah Fava, li hija talent ġdid ieħor għall-Badminton f’Malta, iżda tal-ewwel ħarġu rebbieħa f’logħba missielta ferm. 49 atleta ħadu sehem fis-singles li ġew maqsuma f’sitt diviżjonijiet. L-ewwel diviżjoni ġiet mirbuħa minn Rostislav Peninska (Birkirkara BC) bi Stefan Salomone (Luxol BC) jispiċċa it-tieni b’żewġ punti inqas biss warajh u Matthew Abela (Paola BC) jispiċċa it-tielet. Il-konfront bejn Peninska u Salomone kien wieħed deċiziv, fejn Peninska għeleb lil Salomone biex tela’ fuq quddiem tal-klassifika. Fit-tieni diviżjoni rajna kompetizzjoni wkoll bilanċjata ferm b’Robert Salomone (Luxol BC) jirbaħ din id-diviżjoni bi 13-il punt, warajh Kyle Sciberras (Luxol BC) bi 11-il punt u Edmond Abela (Paola BC) b’ 10 punti. Id-diviżjonijiet l-oħra (tielet, raba’, il-ħames u is-sitt diviżjonijiet) ġew mirbuħa minn Matthew Galea (Birkirkara BC), Sarah Fava (Paola BC), Wayne Haber (Msida BC) u Brian Gilford (Paola BC), rispettivament. 54 plejer ħadu sehem fid-doubles b’Samuel Cali u Stefan Salomone (Luxol BC) jirbħu din il-kompetizzjoni, bi Stephen Ferrante u Aldo Polidano (B’Kara BC) jispiċċaw it-tieni u Matthew Abela u Owen Grech it-tielet. Rodney Abela u Patrick Cassar (Paola BC) rebħu it-tieni diviżjoni u Edward Haber u Jose Yago Mallari (Msida BC) rebħu it-tielet diviżjoni. 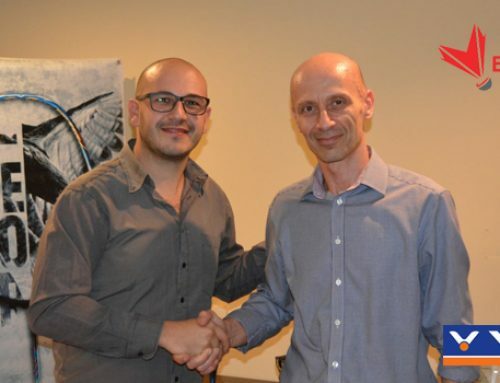 David Attard u Godwin Ellul (Shuttles BC) rebħu ir-raba’ diviżjoni. Fil-Mixed Doubles ħadu sehem wkoll numru sabiħ ta’ parteċipanti. Stephen Ferrante u Fiorella M Sadowski (B’Kara BC) ħarġu bl-unuri segwiti minn Matthew Abela u Jo’Anne Cassar (Paola BC) u Kenneth Vella u Sarah Fava (Paola BC). 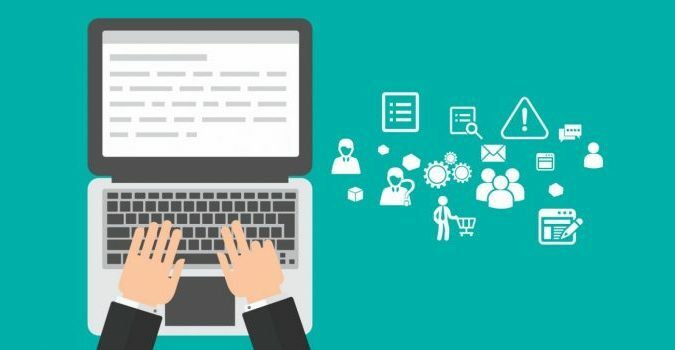 It-tieni diviżjoni ġiet merbuħa minn Kyle Sciberras u Tiziana Mifsud (Luxol BC) segwiti minn Nigel Degaetano u Yanika Polidano (B’Kara BC). Edmond Abela u Martina Vella (Paola BC) klassifikaw fit-tielet post. Din is-sena il-Kompetizzjoni Mixed Teams League reġgħet ġiet mirbuħa minn B’Kara Smart Office Supplies. Paola BC 1 klassifikaw fit-tieni post wara li intlgħabet decider kontra Luxol Top Choice, wara li dawn spiċċaw il-kampjonat bl-istess ammont ta’ punti. Paola Junior (1) rebħu it-titlu tal-Junior Mixed Teams League li kien organizzat għat-tieni sena konsekuttiva. 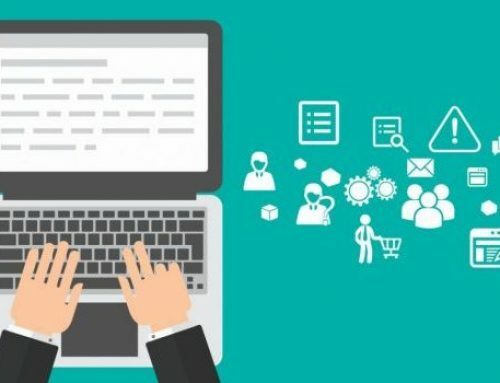 Din il-kompetizzjoni tagħti l-opportunitá lil plejers izgħar biex jilgħabu iktar logħob waqt l-istaġun. 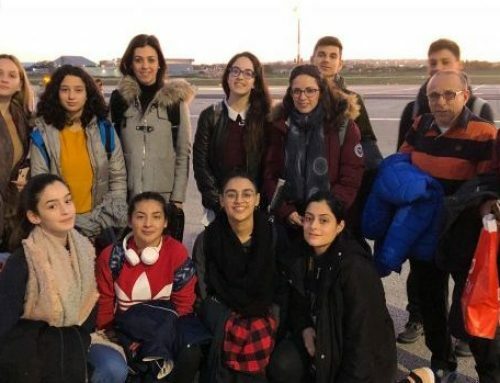 Hekk kif spiċċa l-istaġun tal-kompetizzjonijiet, Badminton Malta organizzat il-Laqgħa Ġenerali Annwali fl-aħħar ta’ Lulju fejn il-Kumitat Eżekuttiv reġa’ ingħata il-fiduċja għas-sentejn li ġejjin. Badminton Malta, mmexxija mill-President Chris Spiteri, bl-għajnuna tal-iSchool Sport Federation, se tkun qed torganizza l-ISF (International School Sport Federation) World Badminton Championships f’Malta bejn it-28 u it-3 ta’ April 2016. Kelliem għall-Badminton Malta qal li bidliet kbar qed isiru fl-Assoċjazzjoni, propju biex inqisu il-Badminton iktar bħala sport individwali.